Head table wedding decoration ideas have not really changed that much since the eighties, swags of material at the front of the table with garlands of ivy isn't horrible but you can do so much better! 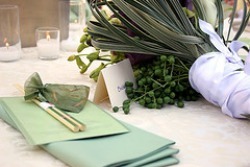 Some venues will even charge you around $70 extra to place swags of material on the front of the top table! 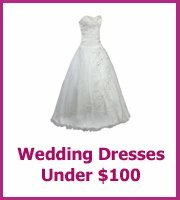 Another shocking wedding cost, especially when you think they can reuse the swags. 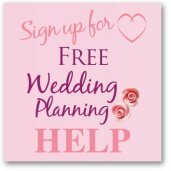 You probably have a theme or a color for your wedding and it is easy to incorporate those into your decorations without adding too much expense. Think about hiring different colored linens as a slip cover to the white linen underneath, it could be a dramatic damask or a vintage design that you have picked up from Ebay, if it fits with your theme it will work on your top table. 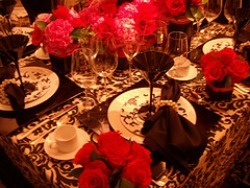 Be bold with your designs, your top table will be the center of attention at your wedding reception. 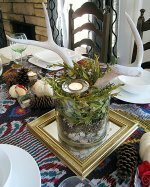 Use the cheap centerpiece ideas to get ideas for your head table, just remember use long and low centerpieces for the top table as your guests will want to see you. It could be as simple as a row of fruit, or a row of lanterns. 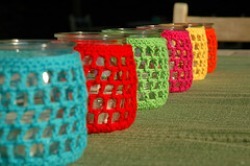 If your wedding is more informal and relaxed then a row of tealights is simple and effective. 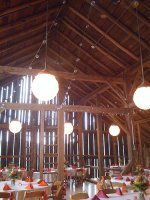 If you are having a more formal reception then you will want your top table to refelect this, instead use candelabras - make sure you ask the venue if they have any that you can borrow, they are normally free of charge! If you want flowers for your top table decorations the cheapest way is to use your bridesmaid bouquets, you could have vases waiting for them or just have them laid on the table. Your own bouquet can then be used to decorate the cake table. If you have paid for flowers at your ceremony make sure you take them with you for the reception, a pedestal arrangement would look great as a backdrop behind the top table and pew swags can be used on the front of the table. You can easily be charged a fortune for a backdrop to your top table, only have one if you need one and the cheapest option is to have muslin draped at the back. Buy the widest muslin you can, hem it with tape and then add decorations. It could be fairy lights from Christmas, or paper lanterns or ribbon, have a play around to see what works for you. Check with the venue that there will be somewhere to secure the backdrop and also make sure you can get into the venue long before the event, ideally the day before to put up all of your decorations.